Good evening everyone! 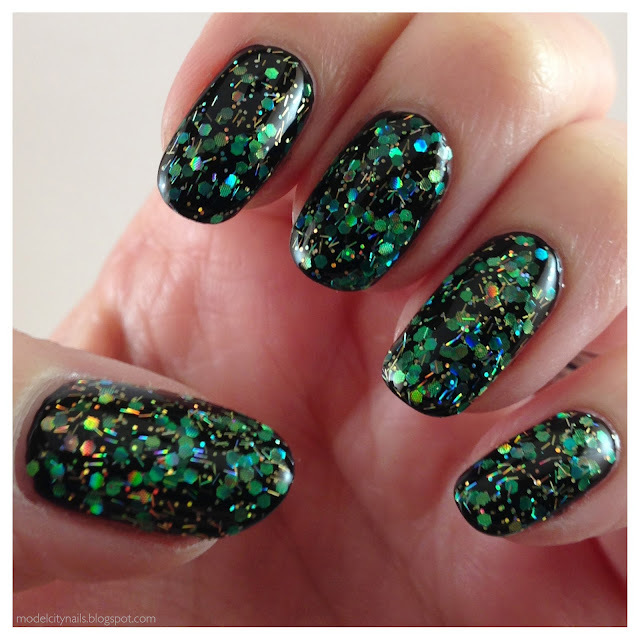 I have an amazing polish to share with you guys that is just perfect for St. Patty’s Day or any day you want something simply perfect. I had wanted this polish for months and finally snagged it during one of Sally’s wonderful 50% Clearance weekends, less than $2! 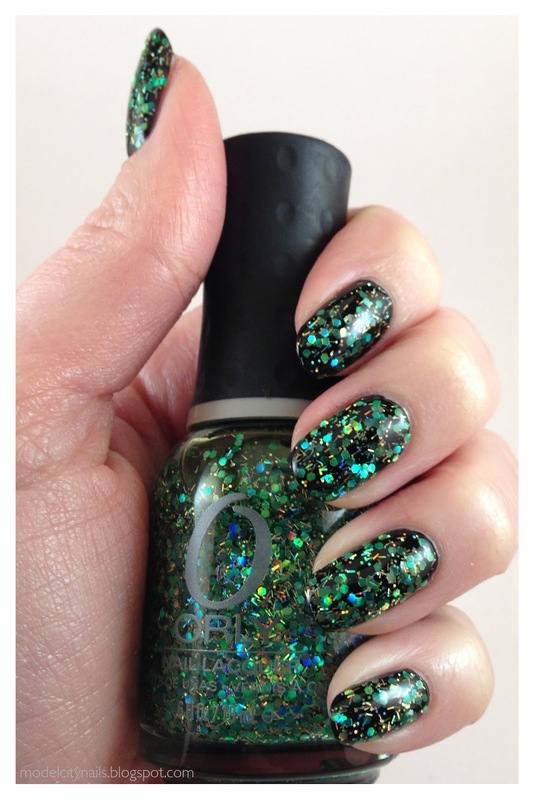 Over the past few months I have became a pretty big fan of Orly products and certainly look forward to owning more. Enough blabbing and on to the polish. Monster Mash is simply amazing. 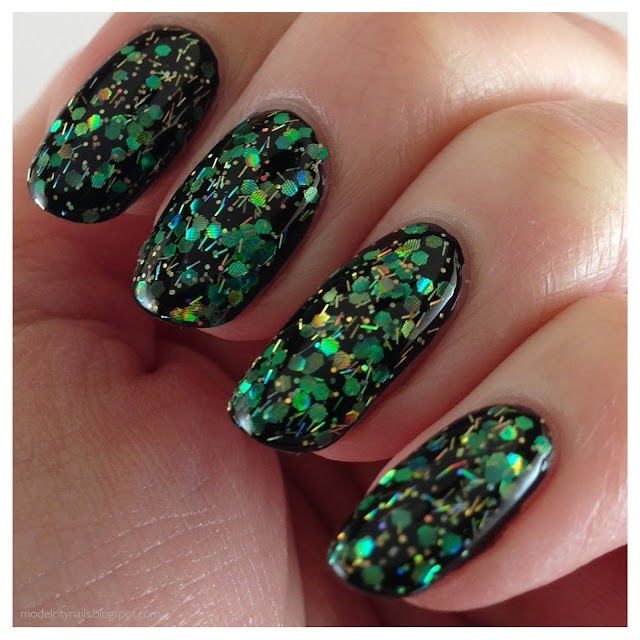 It is a very lightly tinted green base packed with large green holographic hex glitter, super tiny gold holographic glitter, and short gold holographic bar glitter. Application is wonderful and I only had to use one coat so you know this puppy is going to last. The polish was everything I had dreamed it to be. I have received so many complements on me nails over the past two days, certainly an eye catcher. 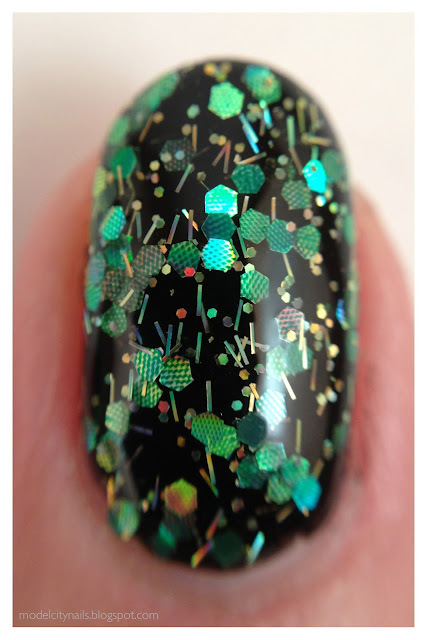 I paired this one with my Sinful Colors Black On Black and it made it pop even more. Look at that glitter! I love this polish and am now on the hunt for the rest of the series. You can still pick up Monster Mash pretty easily on Amazon so I would highly suggest picking up one while you can. Thanks a ton for stopping by this evening and I look forward to seeing you guys again soon! Waaaaah, why can’t I ever find goos polishes in Sally’s clearance, lol. This is beautiful! Thanks! This is certainly one of my favorites for sure! This only makes me want a black polish more so I can sport great looking glitters such as this. Sinful Colors is cheap and easily accessible. Perfect black for any collection.